Remember them, they were delish! Guaranteed to burn your mouth, especially the roof of your mouth ! I remember those Buitoni Frozen Instant pizzas and the tv commercials with the mean looking corperate exec.Who looked as if..nothing pleased him..except..when custormers..bought his foods. 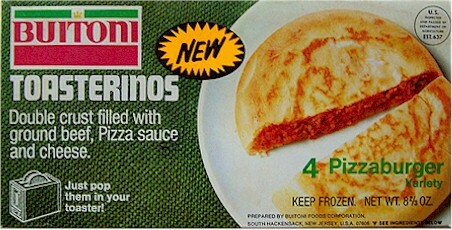 I adore these and still miss them although I doubt any of the ingredients came close to actual beef, cheese or Pizza sauce. I would torch these in the toaster and devour them, often searing the skin off my lips. The interior became as hot as lava.